Krav Maga is inherently different from other forms of martial arts. Originally developed for the Israeli military, the discipline is less about mystique and tradition and more about eliminating your opponent as quickly and effectively as possible. A skilled practitioner of Krav Maga is, in essence, a walking human weapon. At the same time, however, there is a wisdom behind Krav Maga that is seen in all disciplines of the martial arts. One of the first things a student learns is to avoid confrontation whenever possible. It is only when it is impossible or unsafe that an attack is mounted. These attacks aim to end the fight as quickly as possible by targeting vulnerable parts of the body. Krav Maga is a unique martial arts discipline that is well-suited for both men and women. Krav Maga works no matter who your opponent is, regardless of size, or height. It is perfect for those that are looking to improve their self-defense skills or want to get into better shape than they’ve ever been before. It is also a great way to meet like-minded people and become part of a unique community. Krav Maga was originally developed for use by the Israeli military. It combines techniques from boxing, savate, Muay Thai, Wing Chun, Judo, Jiu-Jitsu, wrestling, and grappling. Training in Krav Maga focuses on application of knowledge in real-world street fighting situations. The first person to develop Krav Maga was Imi Lichtenfeld. Trained as a boxer and a wrestler, Lichtenfeld developed the new martial art to help defend the Jewish quarter from fascist groups in Czechoslovakia during the late 1930s and early 1940s. He started to give lessons in Krav Maga to the Israeli Defense Forces after immigrating to Israel in the late 1940s. The development of Krav Maga took off from here and has since been refined by the Mossad and Shin Bet law enforcement, as well as intelligence organizations. 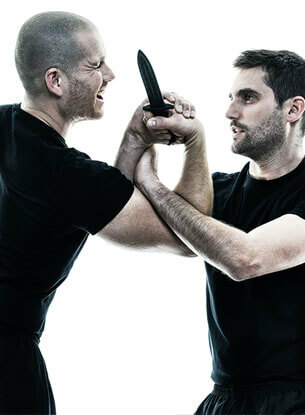 The primary goal of Krav Maga is to neutralize the threat as quickly and efficiently as possible. Anything goes in Krav Maga. There is very little fighting etiquette to learn and an emphasis is placed on attacking vulnerable soft tissues and pressure points, such as the eyes, neck or throat, face, solar plexus, groin, ribs, knee, foot, and fingers. Maintaining an awareness of your surroundings is also key. In a street setting, it is vital to know what is happening all around you. For example, if you are arguing with someone on the street, you don’t know the intentions of any third-party observers gathered around you. They could very well be looking for an opportunity to attack. Krav Maga doesn’t shy away from the use of weapons. 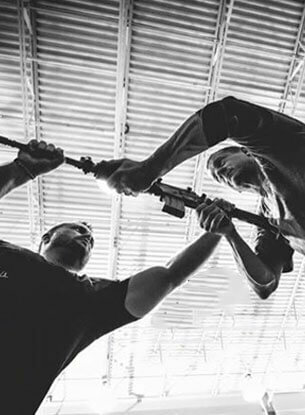 Practitioners are taught how to incorporate firearms and knives into their practice. They are also taught how to improvise and use surrounding objects such as keys, pens, belts, and chairs as weapons. Fighting environments can be very unpredictable. In a real-life setting, you are probably not going to be surrounded by a ring. It is also likely that you won’t be fighting a single person. Attacks can come from anywhere, when you least expect them. You might be squaring off against an opponent head on when a third-party attacks you from behind. Krav Maga trains you for situations just like these. It teaches you how to be aware of your surroundings and protect yourself in real life. We'll show you how to take down an attacker as quickly as possible by focusing on their pressure points and vulnerable areas. You will learn defense against chokes, knife and gun defense, basic combatives and much more. You'll learn how to get out of danger and make your way to safety quickly and efficiently. Every week we have a new Krav Maga class planned for you. Using the goals of the class for the month we formulate our exercises, drills, and techniques for every ability level from beginner to advanced. There is always the next level to achieve and to better yourself. “What I like about Valor is that they are all very respectful. Kru Patrick teaches his students respect towards others, themselves, and also our country. I also like how the coaches and Kru Patrick break down the movements, step-by-step, in their lessons to make sure their students are understanding everything well. Another plus with Valor is that they keep up with the gear in the academy. There aren’t any old, worn down, ripping bags or pads for their students to use. Valor makes sure to use what is best for their students.” – Derick K. M.